What Is S&OP And Why Should All SMEs Take It Seriously?. S&OP (Sales and Operations Planning) is more than just demand forecasting and it is not just a process to ensure continuity of supply. S&OP is not a replacement for MRP and it is not an IT system. S&OP is an iterative and cyclical process to drive continuous improvement throughout the business. S&OP provides a framework to allow alignment, decision making, accountability, teamwork, visibility, risk management and investment. It produces the toolset to allow the business to monitor performance across different workstreams, whilst giving confidence and agreement as to what the future looks like. At this point it is important to state that a formal S&OP process may not be suitable for every company, however, every organisation should understand the principles behind the concept, and consider if and how it could help drive improvement. What organisation wouldn’t benefit from an improvement in forecast accuracy, reduced inventory with quicker turns, increased service levels, SKU rationalisation and top-line revenue growth? S&OP nearly always runs in monthly cycles, with defined stages, gateways, meetings and actions. Generation of historical data is always the starting point, giving the foundations for monitoring of past performance, whilst giving the latest information to revise predictions for the future. Demand Planning follows, looking at sales against forecast against the plan, considering all the latest knowledge of the market, products, customers and NPI, to produce a revised demand forecast. This then allows Supply Planning, using the revised demand forecast, and taking account of capacities and constraints, to plan production or purchases, and identify any gaps or exceptions. The cycle then culminates in the S&OP Meeting (sometimes following a pre-S&OP meeting), where exceptions and gaps are reviewed when comparing the revised plan against the financial plan. 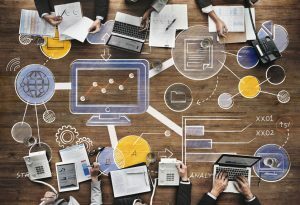 It is at this stage that the executive buy-in and support becomes more apparent, as representatives from Sales, Marketing, Finance & Operations discuss the current and future issues, and make informed, considered and accountable decisions on the actions needed to align the business going forward. Outputs can include agreement on plans for sales, production, NPI, inventory, purchasing and resources. S&OP isn’t one size fits all. S&OP should be tailored to the organisation, to the size of business, the industry, the supply chain model and to the ownership structure of the company. Although the stages above are mandatory, they can be merged into fewer individual steps and fewer meetings. Rules need to be defined to fit the organisation – at what level does planning take place i.e. by Brand, by Product Group, by Region, by Type? What is the planning horizon? These rules will help determine the specific inputs, outputs and objectives of the S&OP process. In summary, S&OP has joined up thinking for businesses that want better monitoring of the past, better visibility of the present, and better control over the future. For more information on S&OP contact us.